U.S. President Donald Trump addresses supporters during a "Make America Great Again" rally in Southaven, Mississippi, Oct. 2, 2018. President Trump is drawing criticism from key Republican senators over his remarks mocking a woman who accused his Supreme Court nominee of sexual assault. The FBI is investigating allegations against Supreme Court nominee Brett Kavanaugh who denies that he mistreated or assaulted women during high school and college. "His [Trump’s] comments were just plain wrong,” Maine Senator Susan Collins, one of two Republicans who have given no indication how they will vote on the nomination, told reporters at the Capitol. Alaska Senator Lisa Murkowski called the remarks "wholly inappropriate and in my view unacceptable." Addressing thousands of supporters at a Mississippi rally, Trump gave his own re-enactment of Ford's responses to questions at last week’s Senate hearing where she testified that Kavanaugh assaulted her at a high school party in 1982. “I had one beer!” he said, impersonating Ford. “How did you get home? I don’t remember. How did you get there? I don’t remember. Where is the place? I don’t remember. How many years ago was it? I don’t know. I don’t know. I don’t know!” “Upstairs, downstairs where was it? I don’t know,” he said. FILE - Professor Christine Blasey Ford and U.S. Supreme Court nominee Brett Kavanaugh (R), testify in this combination photo during a Senate Judiciary Committee confirmation, Sept. 27, 2018. 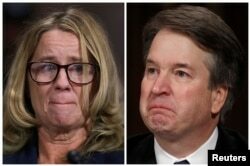 Ford told Senate Judiciary Committee that, despite some memory lapses, she was "100 percent certain" it was a drunken Kavanaugh who pinned her to a bed, groped her, and put his hand over her mouth to muffle her screams for help. 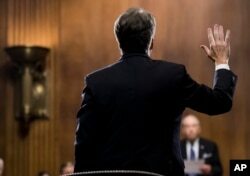 Kavanaugh testified he has never assaulted anyone and complained he is the victim of a “political hit” to destroy his reputation. Trump’s remarks sparked an outcry from many but not all quarters on Capitol Hill. White House spokesperson Sarah Huckabee Sanders said Trump was merely stating the facts of the case and remains confident in his nominee. 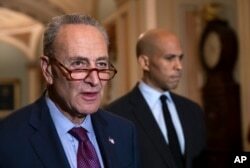 Senate Minority Leader Chuck Schumer, D-New York, with Sen. Cory Booker, D-New Jersey, at right, pauses as they speak to reporters about the political battle around the confirmation of President Donald Trump's Supreme Court nominee, Brett Kavanaugh, on Capitol Hill in Washington, Oct. 2, 2018. Responding to the outcry, presidential counselor Kellyanne Conway suggested that the White House has gone out of its way to be respectful to Ford. "She's been treated like a Faberge egg by all of us," Conway told reporters. At the Senate, many of Kavanaugh’s most ardent Republican supporters did not immediately comment on the president’s remarks. During a 15-minute floor speech on the Kavanaugh nomination, Majority Leader Mitch McConnell said nothing about Trump’s mockery of Ford but spoke at length about Republican senators being hassled and ridiculed in public about the upcoming confirmation vote. 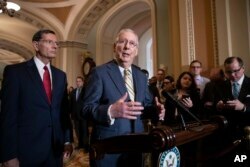 Senate Majority Leader Mitch McConnell, R-Ky., joined at left by Sen. John Barrasso, R-Wyo., speaks to reporters about the political battle for confirmation of President Donald Trump's Supreme Court nominee, Brett Kavanaugh, following a closed-door GOP policy meeting, at the Capitol in Washington, Oct. 2, 2018. Majority Leader Mitch McConnell said the confirmation vote will occur once senators of both parties have a chance to review the FBI's conclusions. "What I can tell you with certainty is that we'll have an FBI report this week and we'll have a vote this week," McConnell told reporters. "We need to be briefed by the FBI, by the agent in charge," Minority Leader Chuck Schumer, a New York Democrat, said. "The FBI must not be handcuffed, and their results should be made public." Republicans, who control the chamber and the timing of votes, delayed a final confirmation vote for one week to allow the FBI to investigate the allegations of sexual misconduct against Kavanaugh. Democrats want the White House’s instructions to the FBI to be made public, along with the FBI’s conclusions, and for agents to brief senators behind closed doors on what they uncovered. McConnell said senators will be able to read the report in private before voting on Kavanaugh, and ridiculed the idea of FBI agents briefing senators. "If confirmed, Kavanaugh, an appellate judge and judicial conservative, would replace retired Supreme Court Justice Anthony Kennedy. The nine-member court is currently operating with eight justices. Republicans hold a 51-49 Senate majority heading into next month's midterm elections that will determine which political party controls both houses of Congress. Have Teen Parties Changed Much Since 1982?